If the generals and insane leader of an unfriendly nation knew that the country they were provoking had the capability to drop a significant tonnage of explosives on their heads in an hour or less, would that serve as a deterrent? News wires recently reported on a successful test of the USAF's Falcon Hypersonic Technology Vehicle (HTV) that has such a potential. The first test a couple months ago ended in failure, but evidently the kinks have been worked out. 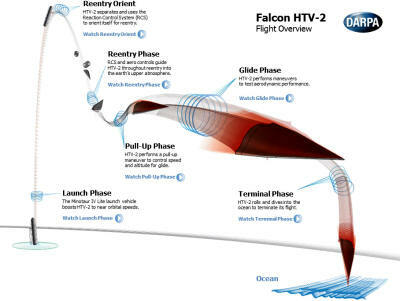 According to DARPA's website, "Falcon HTV-2 is an unmanned, rocket-launched, maneuverable aircraft that glides through the Earth’s atmosphere at incredibly fast speeds—Mach 20 (approximately 13,000 mph). At HTV-2 speeds, flight time between New York City and Los Angeles would be less than 12 minutes. The HTV-2 vehicle is a 'data truck' with numerous sensors that collect data in an uncertain operating envelope." HTV-2 is essentially a 21st century version of the ICBM. Whereas the reentry vehicle of the Minuteman III ICBMs are "dumb" insofar as they are not steerable once separated from the final propulsion stage, the HTV-2 is a precision targeting platform that can constantly assesses its flight path and makes micro adjustments to ensure the warhead is delivered exactly on top of its intended victim. If you have ever viewed any of the footage available of smart missile attacks on Jihadis in the Afghanistan deserts, you will appreciate the precision with which modern weapons can fly. The rotten SOBs never even know it's coming! DARPA does not mention whether the HTV-2 can be assigned a new target after launch phase. At Mach 20 airspeeds, there is not much time to redirect or scuttle the mission if the Dear Leader of some rogue regime changes her mind at the last moment. I just hope no defense contractor decides to sell the technology to a foreign military as one well-known company did with an ICBM stabilization platform in the 1990s.